Retirees can count on these six solid dividend stocks for greater income and long-term stability. Dividend stocks make for a great investment choice if you're looking to boost your income in retirement. But the key lies in selecting strong dividend-paying companies with solid growth avenues and financials to ensure they can sustain dividends during difficult times and offer a nice raise when things are smooth. Finding such a company, however, isn't an easy job. Keeping that in mind, we asked our contributors to suggest dividend stock ideas that are perfect for retirees to own. Here are six names to consider. Jason Hall: Phillips 66 (NYSE:PSX) is a rare business which can potentially provide three things especially important to retirees: Capital preservation; income; opportunity for long-term growth. 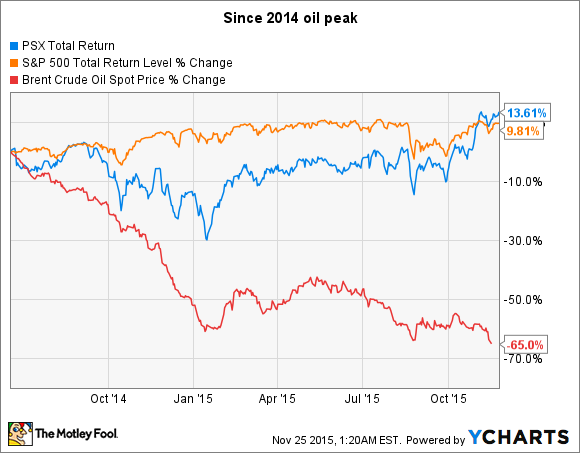 Not only has the company's stock held up well, but it's actually outperformed the market since the 2014 oil peak. Here's why. In short, Phillips 66's operates in the midstream and downstream segments of the oil and gas business. That means limited exposure to commodity price swings, since its services are largely based on volume. And its petrochemicals and refining businesses, which are exposed to some commodity impact, have strong competitive advantages which turn those potential weaknesses into strengths. In other words, the company is -- while not immune -- far less exposed to energy prices than oil-drilling peers, and has actually benefited from cheap American oil and gas. Factor in steady demand for its products and services, and Phillips 66 produces consistent operating cash flows that it returns to shareholders in dividends and share buybacks. However, management retains enough cash to focus on organic expansion, expanding its high-demand pipeline and petrochemicals businesses. Add it all up, and Phillips 66 is an ideal stock for retirees to invest in for the long-term. Beth McKenna: American Water Works (NYSE:AWR), the largest investor-owned water and waste water utility in the United States, would make a great addition to many retirees' portfolios. It spouts, to varying degrees, the trio of qualities Jason mentioned that are important to many retirees: capital preservation, potential for long-term growth, and income. The company's stock has considerably outperformed the market over the long term while incurring considerably lower-than-market risk. Since its April 2008 IPO, the stock's total return is 247%, whipping the S&P 500's return of 79%. It sports a beta of 0.25, which means it has just one-quarter of the risk of the overall market, in terms of stock-price volatility. American Water Works' potential for future long-term growth looks just as bright. Its size means that it should continue to be very successful at gobbling up smaller utilities in this very fragmented industry. Additionally, demand for fresh water should grow as the population increases, while supply will probably shrink because the Earth is in a long-term warming trend. The company can particularly benefit from this supply-demand equation in its non-regulated segment, where it can set its own rates. The dividend yield is currently 2.4%, which is on the low side for dividend-paying stocks. However, it's important for retirees who invest in higher-yielding, yet more volatile and higher-risk, stocks to balance their portfolios with stocks such as American Water Works. Adam Galas: I recommend Enterprise Products Partners (NYSE:EPD) in a taxable account since it's an MLP and thus comes with certain tax benefits. Why Enterprise? Three main reasons: its yield, conservative distribution policy, and stupendously consistent growth record that is likely to continue for decades to come. Enterprise Products Partners currently yields 6% secured by one of the highest 12 month distribution coverage ratios in the industry, 1.87. That means that not only is the payout rock-solid, but also that Enterprise is generating a massive amount of excess distributable cash flow or DCF, which is generated by Enterprises' long-term fixed-fee contracts that create a toll-booth like river of recurring cash flow, that is almost entirely immune from volatile energy prices. Speaking of growth Enterprise Products Partners has an amazing 45 straight quarters of distribution growth under its belt. That's over 11 years of continuous payout growth including two of the worst oil crashes in a generation. In fact over the past year Enterprise's $2.6 billion in excess DCF has helped it to maintain an exquisitely strong balance sheet and keeps dilutive equity issuances to a minimum. With $4.7 billion in available liquidity and $7.8 billion in growth projects scheduled to come online by the end of 2017, Enterprise Products Partners' can look forward to continued steady payout growth; no matter what energy prices do in the short-term. Chuck Saletta: ADT (UNKNOWN:ADT.DL) has a simple, yet profitable business model that makes it a great company to own. It's a well-known security monitoring company, leading in that a capital-light, yet sticky business. It sells people alarm systems, and then turns around and charges those same folks to monitor those alarms. What makes it a sticky business is twofold. First, customers frequently get discounts on their homeowners insurance policies for having a house alarm. Second, customers don't generally want to shell out the cash to remove one system and then buy a different system, just to save a few dollars per month on the monitoring fee. From a dividend perspective, ADT's yield is about 2.4%, which is ahead of the S&P 500's average yield of 2%. In addition, with a payout ratio less of less than half its earnings, ADT has room to increase its dividend as its business continues to grow. ADT has increased its dividend every year since it spun out from Tyco in 2012, and it looks like it can continue that streak when it's scheduled to announce its next dividend payment in January. Dan Caplinger: It's tempting for retirees to take as little risk as possible with their stock choices. Yet in some cases, cyclical stocks can be smart buys at the right time. Heavy-equipment maker Caterpillar (NYSE:CAT) is currently at a down-point in its business cycle, but it's setting the stage for a potential rebound in the future. Caterpillar has suffered mightily in recent years. The macroeconomic slowdown in emerging-market economies hurt its infrastructure and construction business, and it subsequently led to the decline in demand for commodities that precipitated substantial declines in prices for mined products. That in turn hurt demand for Caterpillar's mining equipment, and the more recent plunge in oil prices was bad news for the equipment-maker's sales to the energy industry. Now, many of Caterpillar's traditional customers have had to defer capital expenditures in order to conserve cash to make it through their own down-cycles. Investors in Caterpillar are getting a dividend yield of more than 4% while they wait for a recovery, and the company's cost-cutting measures and other strategic initiatives are designed to benefit from improving macroeconomic conditions whenever they come to pass. Caterpillar isn't the no-risk stock that retirees often want, but the potential returns are worth the short-term risk for those who can afford to take on even the possibility of losses in their stock portfolios right now. Neha Chamaria: A chemical company may not excite investors much, but Dow Chemical (NYSE:DOW) deserves your attention if you're looking to boost your portfolio income. A diverse portfolio has helped Dow grow its net income by more than 60% on only about 9% growth in revenue during the past five years. The company's profits should only multiply in coming years, thanks to its twofold approach. On the one hand, Dow is aggressively divesting low-profit businesses while focusing on high-value products to boost margins. On the other, it is investing in high-potential projects such as setting up of the world's largest petrochemical facility. This twofold approach should boost Dow's cash flows significantly while strengthening its financial standing further. Dow held cash and equivalents worth nearly $7.6 billion as of Sept. 30, 2015, and generated free cash flow worth $3.9 billion over the past twelve months. 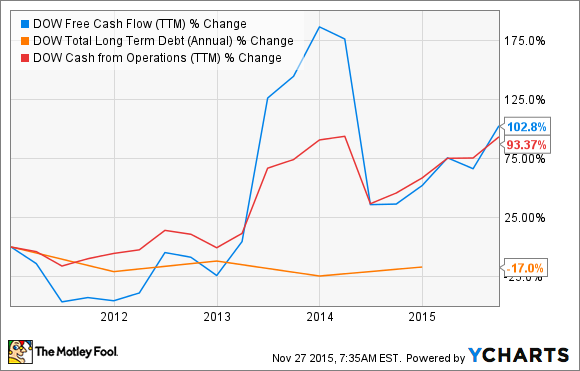 Better yet, the company's cash flows have risen rapidly over the years even as debt declined. As Dow's cash flows expand, shareholders can expect fatter paychecks. A payout ratio of 45% also leaves plenty of room for further dividend increases down the road. The company's quarterly dividend has more than tripled since 2011, and it has paid a dividend every year for nearly a century (yes, you read that right). That track record, and a current yield of 3.5%, makes Dow a great choice for retirees.